Every Saturday and Sunday from March through Christmas Eve, you can shop for beautiful crafts, from pottery and mosaics to jewelry and toys, made by local artisans. Plus there’s live music, an international food court, and craft-making for kids. Stop and smell the blooms on over 8,000 rose bushes at this gorgeous garden. This is the oldest official, continuously operated, public rose test garden in the United States. Roses are sent to the garden from around the world to be tested in Portland's climate. 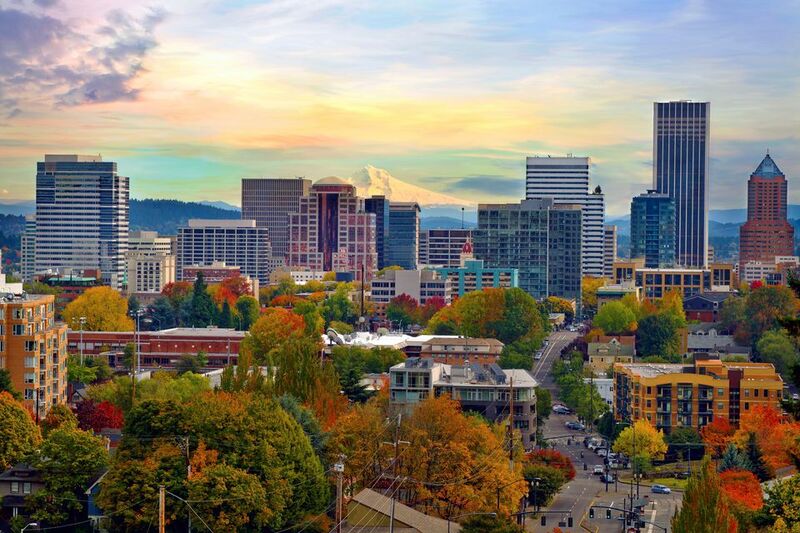 Come on a clear day to experience glorious views of downtown Portland and Mount Hood. Come see creatures from around the world, and take advantage of the zoo's nationally recognized educational programs. Explore 64 acres of wildlife, from penguins to primates. The Oregon Zoo is recognized internationally for having the most successful breeding herd of Asian elephants of any zoo. Admission is $17.95 for adults, $15.95 for seniors, $12.95 for children ages 3–11 and free from children ages 2 and under. This Suzhou-style garden was built to honor the sisterhood between the city of Portland and the city of Suzhou, China. The majority of the plants in the garden are indigenous to China, but they were grown in the United States. The garden is designed to awaken all the senses, yet it’s one of the most peaceful places in the city. Admission is $10 for adults, $9 for seniors, $7 for students and free for children under 5 and members. Guided public tours are daily at noon and 1 p.m. Widely known as one of the most authentic Japanese gardens outside of Japan, this meticulously cared for sanctuary is amazing to visit any time of the year. Take your time walking the various pathways and notice the fine details of the Strolling Pond Garden, the Tea Garden, and the Sand and Stone Garden. Stop to take in the beauty of the koi pond and Heavenly Falls. Daily guided tours are offered April through October a few times a day. Admission is $16.95 for adults, $14.50 for seniors, $13.50 for students, $11.50 for children ages 6–17, and free for members and children 5 and under. Math, science, technology: It’s all part of the Oregon Museum of Science and Industry. There’s so much to explore here. Permanent exhibits include the Life Science exhibit, which tracks how humans grow from conception to old age, and various labs where kids can do science experiments and learn about chemistry, biology and more. Other attractions include the planetarium, OMNIMAX theater, and the USS Blueback Submarine, which was featured in the movie Hunt for Red October. Admission is $14.50 for adults, $11.25 for seniors and $9.75 for youth. Admission to the planetarium, theater and submarine are separate. Check the website for rotating exhibits. Tour this incredible turn-of-the century treasure, home to Portland pioneers Henry and Georgiana Pittock from 1914 to 1919. Not only is every room of the fully-furnished mansion stunning, but the grounds are lovely as well. Have a picnic and enjoy sweeping views of Portland and the Cascade Mountains. Admission to the mansion is $11 for adults, $10 for seniors, $8 for youth ages 6–18 and free for children under 6. The museums hours vary by season, but it is open daily February–December, excluding Thanksgiving Day and Christmas Day. Home to exclusive eateries, amazing shopping, and a high concentration of art galleries, the Pearl District is an excellent place to spend part of your day in Portland. If you time it right, you can experience First Thursday, a monthly celebration of art, urban culture, and the city itself. The Pearl District is just north of downtown Portland. It's between Burnside and the Willamette River, and between I-405 and NW Broadway. Visitors and locals alike flock to this literary haven, located on the edge of the Pearl District. The store takes up an entire city block, so it’s easy to get lost inside (not a bad thing, right?). Grab a map on the main floor if it’s your first time to the store. Highlights include special events with authors and visiting the Rare Book Room. Enjoy the River city by boat. The Portland Spirit offers cruises down the Willamette River, complete with entertainment and a catered meal. Choose a lunch cruise, a dinner cruise, or a brunch cruise or simply take a sightseeing tour and enjoy beautiful city views.